The quality of security lights from the big box home centers seems to be hit and miss (mostly miss). It's really a good idea to read the user reviews before buying one, because many of them seem to die premature deaths. Fortunately, I was able to find one at Lowes that not only got good reviews, but was in stock and came at a reasonable (though not rock bottom) price. 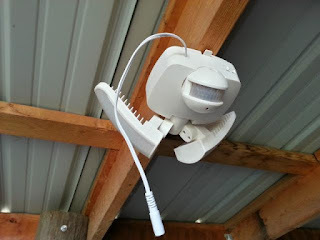 The All-Pro MST800LW from Lowes has dual lights that can be independently aimed, so I could locate it in the middle of my shed and point the lights to both sides. The 180-degree sensor will see movement across the entire front half of the shed. 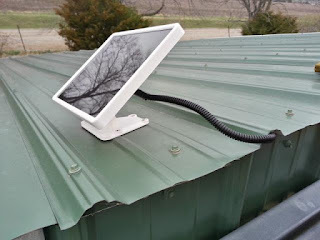 The remote solar panel with a 16-foot cord allowed me to put the panel on the roof and the lights inside. This came with an $80 price tag, which isn't bad. Installation took about an hour. The light/sensor unit has a quick-release mounting bracket, which I screwed to one of the rafters in the center of the shed. 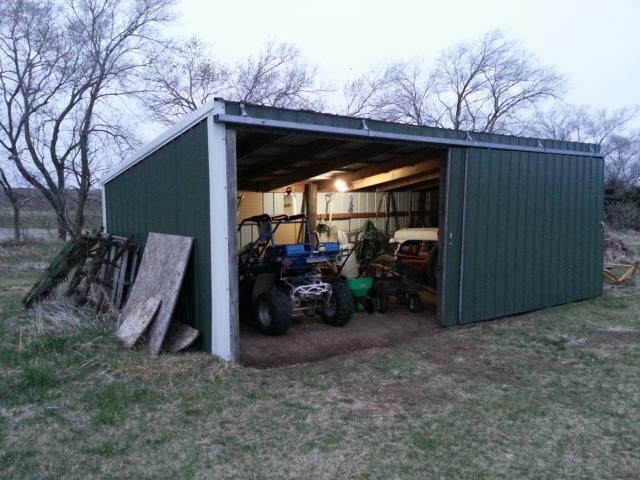 I oriented it with the lights facing toward the rear of the shed and the motion sensor angled toward the front doors. The solar panel was placed on the front edge of the roof. I screwed the mounting panel through the steel roofing into a rafter. Unfortunately, the supplied mounting screws are made of a soft metal, so I stripped two of the screws while installing them. I'd recommend replacing them with exterior-grade construction screws. The angle at which the solar panel sits is determined by rotating it around a splined hinge. I wonder how well it'll hold its position in the strong winds we get out here [Edit: quite well, a year later]. Here in Nebraska, at about 40 degrees north latitude, the sun will climb to about 73 degrees above the horizon in June and sink to about 27 degrees above the horizon in December. You want the panel to face the sun as directly as possible, so I set my panel to about 60 degrees for the upcoming summer, and may lower it to about 35-40 degrees for the winter. I ran the power cord through some plastic sheathing as it wrapped around the edge of the steel roofing and into the interior, then stapled it along a rafter until it reached the lights. Once fully installed, everything seems to work perfectly. The duration for which the light stays lit after motion stops is adjustable, and I set it at the maximum of three minutes. That seems like a short amount of time, but I suppose you don't want to unnecessarily run down the small battery of this solar charger. 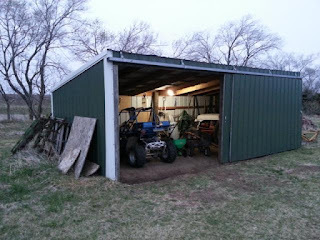 Time will tell how well it holds up, but for the time being, I'm going to enjoy being able to see where I'm going when I pull the tractor into the shed after a long day's work. Update:￼ A few months after installing this light, it refused to stay lit for more than about 15 seconds. The manufacturer replaced it under warranty, and the new one seems to be working well after about a year of use.